Custom Baskets - The Happy Basket Co. Need a memorable custom gift basket? For over a decade, The Happy Basket Co has been putting smiles on people’s faces by delivering one of a kind custom gift baskets. If you can dream it, we can make it a reality. On this page you will find some of our more popular custom gift basket categories. Browse through and contact us to discuss the needs for your upcoming event. If you do not see a category that you are looking for, no problem, just reach out to Heidy and explain what you are thinking about. The Happy Basket Co has made thousands of custom baskets over the years ranging from single baskets up to several dozen at a time for corporate clients, wedding socials and fundraising events. All of our custom gift baskets are creatively designed, with colourful and vibrant ribbons, bowes and imaginative decorations. Baby gift baskets are an exciting gift for all new parents. Are you looking for Holiday Gift Baskets? Consider giving the gift of a beautifully packaged holiday basket for your friends and family. If you would like a unique gift for your loved one, friend, family member or business colleague, consider giving them a custom designed tea gift basket. Everybody loves tea! The Happy Basket creates personalized sympathy gift basket made with a caring and loving touch. Many people take time to celebrate a neighbor, a colleague, a friend or a family member. Consider giving an Elegant Basket to them! There are literally hundreds of creative ideas for your custom design. Use the list below to view some of our most popular requests. If you don’t see what you are looking for, do not hesitate to reach out and contact us. A Baby Gift Basket is made and given from the heart. All of our custom gift baskets are creatively designed, with colourful and vibrant ribbons, bowes and imaginative decorations. Baby gift baskets are an exciting gift for all new parents. The joy of discovering and opening each new treasure that’s in every basket is sure to bring a smile! 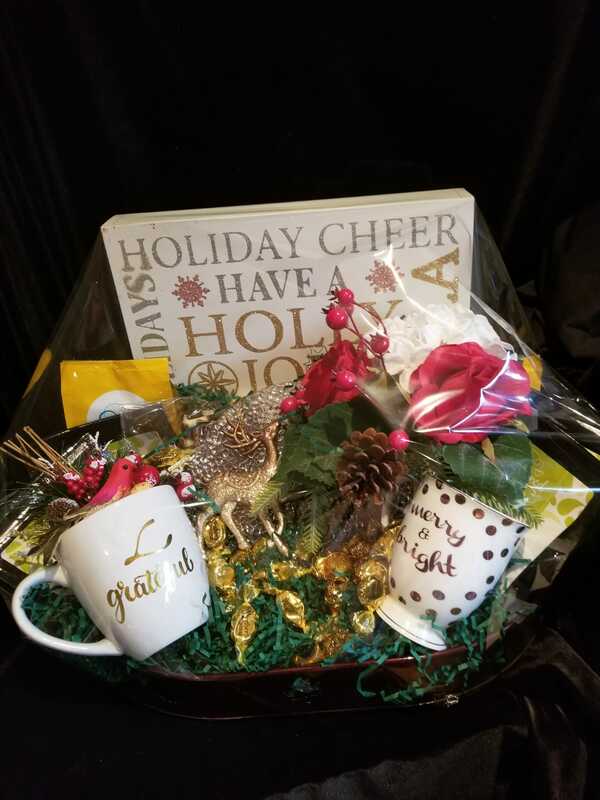 If you have family or friends who love coffee, nothing can be more satisfying than giving them a coffee gift basket on special occasions in life such as birthdays, wedding anniversaries, seasonal holidays or just because. The Happy Basket can help you prepare memorable coffee gift baskets for any occasion. Cookie gift baskets are ideal for birthdays, holidays and any other special occasion. 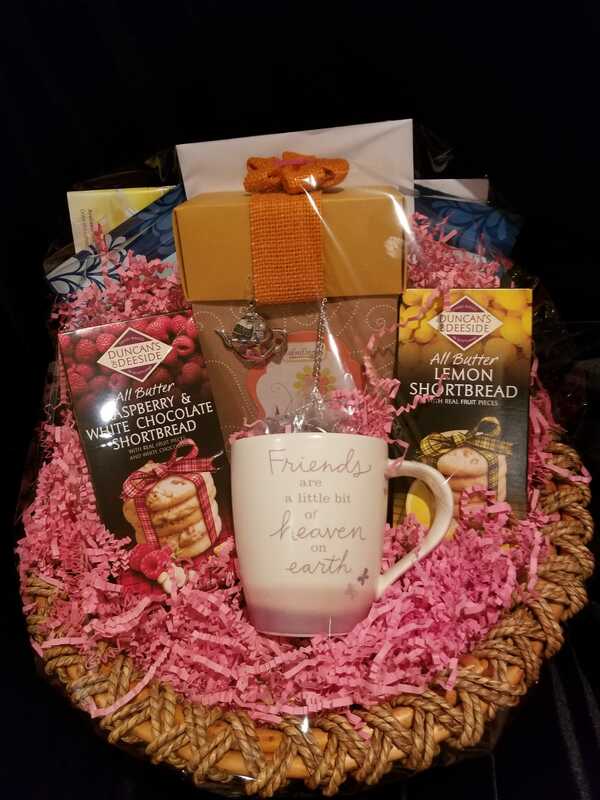 If you’re looking to surprise a colleague, relative or friend with a cookie gift basket, we can create for them, a beautiful one of a kind gift. Cookie gift baskets make the perfect gift for business clients and associates. Whether you want to say ‘Thank You’ or you want to show a gesture of appreciation, you’re sure to be remembered for giving a custom cookie gift basket. 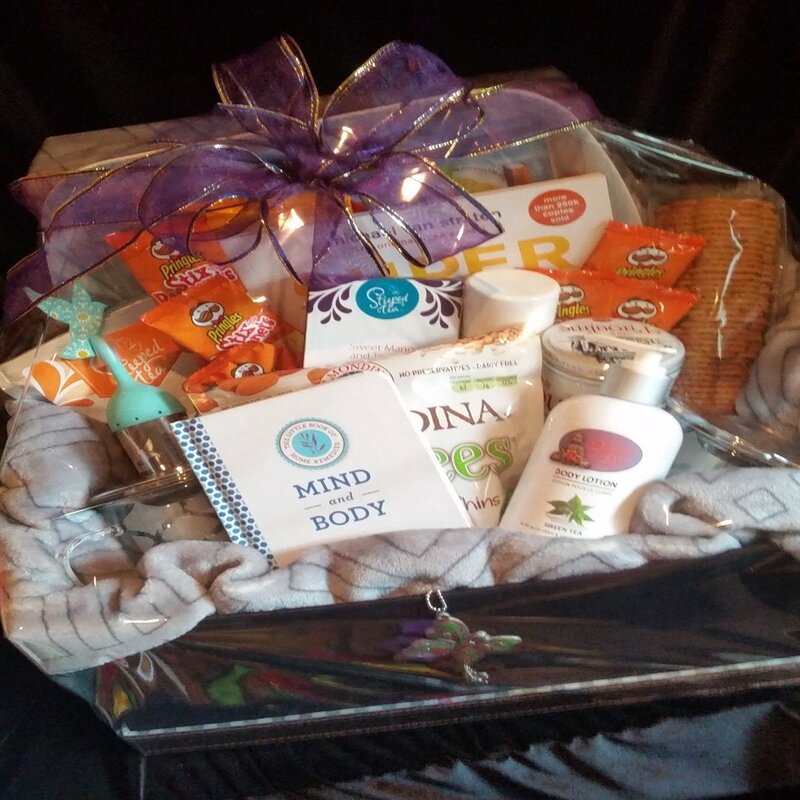 The Happy Basket creates personalized sympathy gift basket made with a caring and loving touch. Many people take time to celebrate a neighbor, a colleague, a friend or a family member. Consider giving an Elegant Gift Basket to them! Food gift baskets are not just a basket full of food. They are so much more than that. Our baskets are all artistically made and designed to meet your client needs. Your food gift basket can be themed around the receiver’s favourite restaurant, favourite food or favourite snacks, etc. You can have restaurant gift cards, snacks, chocolates, fruits, nuts, BBQ utensils, cook books and more inside a custom food gift basket. When searching for the perfect gift, a fruit gift basket is always a great choice. There’s really nothing quite as inviting as a fresh fruit basket, especially around the holidays when so many people are receiving chocolates and candy. Fruit baskets make the perfect gift for all people and all occasions. Rejoice for the great time of holiday seasons! Not only does it steal a break from hectic work schedules but also calls for a celebration with family, friends and loved ones. Why not make the celebration twice as fun? Give the gift of a beautifully packaged, lively holiday gift basket, for your friends and family. As with all of our gift baskets, the holiday gift baskets are fully custom and unique. Whatever your desire is, The Happy Basket creates the perfect basket to help complete a romantic evening, picnic at the park or any special celebration! Romantic gift baskets from The Happy Basket are all about having your individual preferences weaved in by our experienced professionals. As such, you are guaranteed to receive a beautiful romantic gift basket that will make anyone happy! Our unique and custom designed sports gift baskets are perfect for sports enthusiasts. We can design a sports gift basket that’s perfect for your requirements. These sport baskets can be filled with any theme you have in mind. If you’re thinking of something for a hockey fan, football fan, basketball fan, baseball fan or any type of sports fan there is, we can design the perfect gift basket for them! If you would like a unique gift for your loved one, friend, family member or business colleague, consider giving them a custom designed tea gift basket. Everybody loves tea! We can create perfect tea gift baskets filled with a variety of assorted flavours of tea. Your basket can contain herbal tea, green tea, flavoured tea or a mixture of different kinds of teas. We can design a basket filled with caffeinated or decaffeinated teas to suit your desires. Teas are available in either tea bags or loose leaf tea. Special occasions are incomplete without fine wines being served. So, when looking for unique gift ideas, consider giving wine gift baskets from The Happy Basket Co. We deliver tasteful wines in beautifully arranged, custom wine gift baskets. Our wine gift baskets are especially enjoyed by avid wine enthusiasts. Need a Fully Unique & Custom Gift Basket?